look at his sleeves first! Let’s get acquainted with one more way of blackjack cheating. Actually, this type of cheating is not only about blackjack but also about other card games. This is mucking of cards. Sometimes mucked cards can be mixed up with other type of cheating called switching, which is not surprising because these two ways to cheat are very alike. Anyway, they differ a bit. What is called to be mucked cards and how does it work? So, here it is – mucking. What does it mean if speaking about card games and how does it work? Imagine the situation: you are sitting at the blackjack table having your 2 cards in your hand. But you would not mind to have one of them a little bit later during the game when it will be more useful for you. What are you doing? You ask for another card and replace your old one with a new one with a plan to use the old one later. Hm… If you work skillfully with your hands and all your friends never notice how you do this or that trick, then you have all chances to be good in mucking cards. Mucking can also be called hand mucking sometimes. You should actually have a good coordination of hands. This way of cheating is not recommended if you are a novice and did not have any practice before. But what is the difference between mucking and switching? 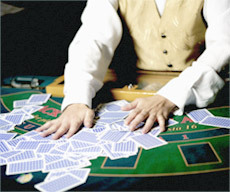 Mucking – using the cards from a dealer’s deck (from the blackjack table). Switching – using your own cards which you have taken with you in advance in order to substitute the dealer’s cards by them during a game.